Clusters of students, parents, friends, and alumni steadily stream across Franklin Boulevard, as if in a mass exodus from the University of Oregon campus. The parade of green-and-yellow–clad fans grows larger with each step closer to Autzen Stadium. But attire isn't the only thing in common: they all share the peace of mind that comes with having a coveted game-day ticket secure in a pocket or purse. At the mouth of the old Autzen Footbridge, hundreds more join the throng. Couples walk hand in hand and children are perched on parents' shoulders. Happy hugs are exchanged and the slapping sounds of celebratory high-fives ring in the air. The fans funnel onto the bridge—bodies draw closer, elbows bump. The uneven rhythm of feet shuffling across concrete is sporadically punctuated by shouts of "Go Ducks!" and combines with the rush of the water below to create a pregame symphony. At the water's edge, the music rises into the trees, a colorful canopy of shimmering leaves illuminated in the slanting light of the setting sun. Across the river and adrift among the fans flowing in the cool shade of Alton Baker Park, I let my senses guide me toward the stadium. Smells of burning charcoal and chilidogs tickle my nose. The closing notes of "Mighty Oregon" echo faintly in the distance. A few more steps and I suddenly emerge from under the sheltering trees, only to enter a different world. A sea of folding chairs, barbeques, coolers, tents, and motor homes fills every inch of the vast parking lot. The display of school spirit gets more elaborate each season, as if in direct competition with last year's tailgating festivities. Even with additions to the sporting complex over the years—the Len Casanova Athletic and Moshofsky Sports Centers, PK Park, and the new Hatfield-Dowlin Complex—the party's footprint is still vast and impressive. Towering above the revelers is Autzen Stadium, a monument of unity for the 55,000 or so fans brought together by one love: the first home football game of the Pac-12 season. It is the ark that carries loyal fans through the tumultuous and competitive sea of college football. While my history at the university will be brief, I know I will forever be among the Ducks that make the migration to Autzen Stadium on those Saturdays in the fall. 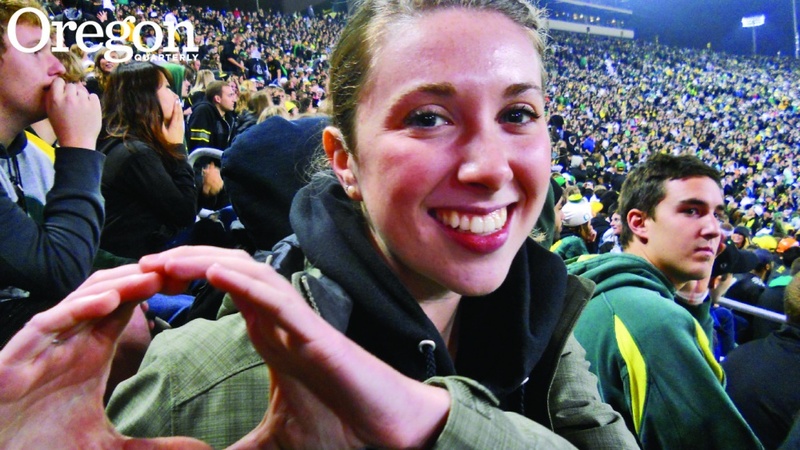 Elliott Kennedy, shown above, is a second-year master's degree student in the Department of Romance Languages, who also completed her undergraduate studies at the UO in journalism and French.